When I first met Jodi, I was floored by how normal she looks. After reading about all her colorful travels and experiences in With Help from Above, I’m not sure what I was expecting her to look like! But the truth is, I think it’s her normalcy and level-headedness that helped shape her experiences and turn them into real stepping stones for personal growth. 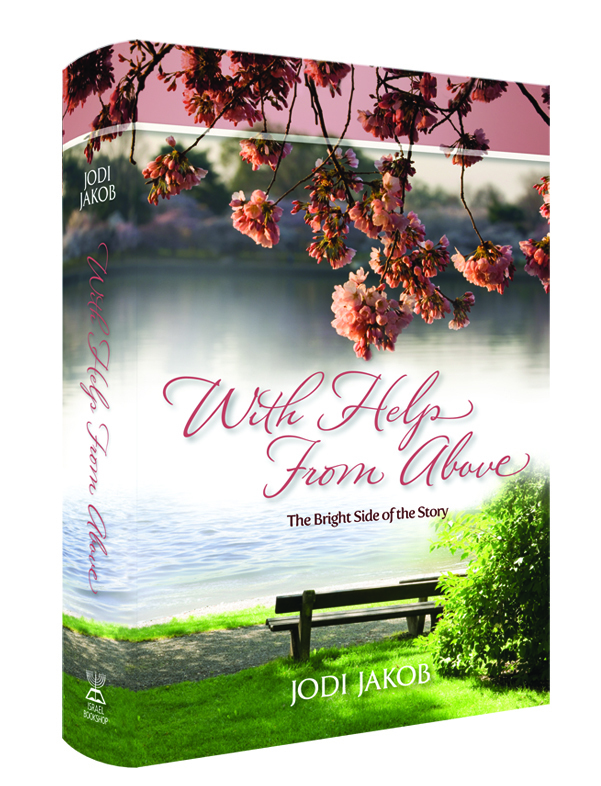 Jodi’s approach to life is—when the going gets tough, you can either fall apart, or you can grow. Why not choose the latter and become a better person? And that’s exactly what Jodi has done. The international community will never be the same following the terror that has been unleashed against the world under the banner of Islamic Jihad. Our family was living in Eretz Yisrael when the Twin Towers that once graced the skyline of Manhattan were destroyed. That day in September shattered America’s sense of optimism and invincibility. That same day has also become a day of personal loss to our family; it was the day that our son lost his unparalleled enthusiasm for learning. At the time when the two planes were crashing into their targets, thousands of miles away, in a beis medrash in Ashdod, our oldest son, Chaim, was diligently plowing through pages of the Gemara on his own. His personal achievements and tremendous dedication to learning were already well known where we lived. In fact, at Chaim’s eighth grade class graduation ceremony, the principal of the cheder told my husband that “there is none like your son in all the chadarim in Israel.” The Av Beis Din of our city, Rabbi Schreiber, even walked to our apartment one afternoon to speak to me personally about carefully guarding over this special gift that Hashem had entrusted to us. (This Rabbi Schreiber, who was the non-chassidishe spiritual leader in Ashdod, used to come weekly from Bnei Brak to test the eighth grade students in learning, and he and our son had grown quite close over the year.) We were reaping great joy from Chaim. He was self-motivated, rushing through his meals and skipping time for rest and relaxation in order to keep up with his personal goals of completing one masechta of Gemara after the other. Chaim was accepted into an elite yeshiva ketanah in Yerushalayim; however, he was homesick being so far away from our family and wanted to be closer to home. Because of this, we had to settle with sending him to the local yeshiva, which was far from suitable for Chaim’s skills. After many discussions with the hanhalah and with a lot of relentless determination, our son finally obtained permission from the yeshiva to at least learn privately and at his own pace in a nearby beis medrash during the afternoon seder, so he would not have to continue being frustrated in the slower-paced class and feeling that he was wasting his time. While our son was busy learning in “his” beis medrash on September 11th, a man entered and told him about what had just happened in New York. Though Chaim was very worried and wanted to find out more about the events, he never stopped learning! He remained in the beis medrash and continued learning as before. However, what was happening in America on that day was not just another news story, it was a historical event of tremendous proportion. Soon afterwards, when another man came into the beis medrash, our son stopped his learning for a moment to ask the man if he knew anything more about the plane crash in New York. What happened afterwards defies the imagination. That man went running to the Rosh Yeshiva and told him, “Chaim Jakob was listening to the radio!” (Listening to the radio is absolutely forbidden in many religious circles in Israel). Otherwise, how else could Chaim have known about the planes crashing into the Twin Towers? Acting on his assumptions and not on our son’s spotless learning record, the Rosh Yeshiva called our son into his office the next morning and put him through an interrogation of the strictest caliber. Our sensitive son felt as though he was being treated like a criminal. Chaim was devastated. Was this how his Rosh Yeshiva perceived him, after all the time and effort he had devoted to pure Torah learning? How could the Rosh Yeshiva have believed such a ridiculous idea about him – that he had been listening to the radio instead of learning? Instead of respecting our son and defending him, the rest of the yeshiva staff followed the Rosh Yeshiva’s lead and continued to mistrust Chaim and treat him unfairly that entire year. It was a horrible, humiliating experience that did permanent damage to our son and left irreversible scars. As much as we tried to comfort Chaim, it was to no avail. This tragic event was the beginning of our son’s downfall, a downfall that soon took on a life of its own, not only affecting Chaim’s Torah study, but many other areas of his life, as well. Though he is now slowly beginning to rise from his fall, many devastatingly unproductive years have passed since that fateful morning in the Rosh Yeshiva’s office. We mourn the thousands who lost their lives on that September morning. Though Chaim did not lose his life, we have lost our son as we once knew him. The Torah learning that he could and would have accomplished had he not been treated with such terrible injustice only exacerbates the loss. We longingly daven and wait to have our enthusiastic and positive child back with us once again. The field of chinuch is a most honorable one. Those who choose to enter its sacred domain must do so with great caution and humility. Teachers, principals, and Roshei Yeshiva have within their grasp the potential to build their blossoming students or to crush their tender spirits. May this painful story serve to remind educators to scrutinize their interaction with their students even more carefully then they did before. May any student suffering from the poor judgment and action taken by an adult in chinuch remember that educators are only human, and that one day the truth will be made crystal clear. And at that time, each and every individual will be treated like the holy kli that he truly is. This entry was posted on Wednesday, May 5th, 2010 at 10:22 am and is filed under Book Excerpt, General, Special Discounts. You can follow any responses to this entry through the RSS 2.0 feed. You can leave a response, or trackback from your own site. I read this book–so inspirational! Jodi Jakobs must be a very special individual. I recommend this book to anyone looking for a lift.